Consumers become more health conscious and picky with the ingredients of food we consume. We are willing to spend more in purchasing food which carries the words like "fresh", "healthy", " "No MSG", "Organic", "Gluten-free", "Natural ingredients", "Free range" etc. in supermarkets. But, how much the labeling claims the truth? When consumers become more demand for healthy food, the manufacturers begin to relabel and repackage their products in order to deceive the consumers' perception and create their impulsive buying behaviour. There are many regular products which are sold at higher prices since they are being mislabeled as "expensive healthy products" in order to meet the consumers' needs. It begins to capture my attention when I read the news last year, Walmart China was sued for mislabeling tons of regular pork as "organic". I begin to wonder how much we can trust the food labeling from the manufacturers. Should we continuously spending more when we are concerned about being mislead on premium products which carries high quality, premium and "healthy terms"? I'm not sure how much I will believe the labeling and manufacturers but if I am given a choice, I would begin farming in my garden for the main reason of food safety. When you grow your own vegetable, you are convinced that your vegetable is fresh and safer to consume as you use less chemical products, compared to the vegetables from the markets. Even more young professionals in China begin growing their vegetables as they concern about the standard of food safety there. Whether we choose to consume the premium or regular food products, we should practice the healthy lifestyle such as, consuming the balance and healthy food and nutrients moderately and exercising every day. A famous Chinese proverb says, 吃饭少几口,活到九十九。(Healthy and moderate eating will prolong our lives up to 99 years). We should adapt the culture of Japanese healthy eating up to 80% full on every meal. We should control our brains on the type and amount of food to consume and not to be controlled by our brains entirely. 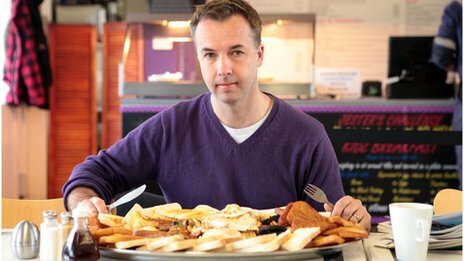 Overeating doesn't bring benefit to us but it causes more health problems and obesity. diabetes or are trying to prevent it), you may toss "no sugar added" products in your grocery cart. Trans fat is bad for your heart, and the ideal intake is zero. But products that say "no trans fat" can actually contain less than 0.5 grams per serving. "If a product says 0 trans fat on it, it isn't actually at zero," says Gardner. "If the consumer were to have two servings, then you would get a good amount added to your diet." Keep in mid that organic is not synonymous with healthy. In fact, it may be anything but. Organic food can still be packed in fat, calories, and sugar. "Companies like to add magnetic words on products to make you think it's healthy," says Taub-Dix. Seared salmon steak with a fresh salad. The LA Times recently reported a dangerous food myth that has been circulating throughout the health-conscious community as of late: cookies and chips are tastier, have fewer calories, less fat and more fiber when they are organic. Organic food labeling has been a hot button issue lately as the nutritional and medical communities often find themselves at odds with food manufacturers that market foods in such a way that consumers perceive organic products as healthier choices. "There are a lot of myths and misconceptions out there when it comes to food marketing," said Lisa Moskovitz, RD, CDN, of Halevy Life. "For example, Twizzlers are labeled as 'low-fat' but they have the same amount of carbohydrates as the average loaf of bread. And that is just one example of how [consumers] are being misled by labeling." According to Dr. Kent Sasse, MD, of Sasse Guide, the U.S. Department of Agriculture (USDA) has established an organic certification program that requires all organic foods to meet strict government standards. These standards regulate how such foods are grown, handled and processed. In order to legally be considered organic, products must be at least 95 percent organic. To be labeled as 100 percent organic, items must be made entirely with organic ingredients. Despite these regulations, there are many mixed messages out there when it comes to the nutritional content of organic food. "Nutritionally speaking, organic packaged foods [such as cookies and crackers] are no healthier than the conventional versions," said Moskovitz. "When it comes to fruit and vegetables, the primary difference is that no chemicals or pesticides have been used in the growing (vegetables), raising (animals) or processing of a food item." In addition to being free of pesticides and chemicals, organic foods tend to be more expensive than conventional. If you're looking to cut down your grocery budget, Moskovitz suggests choosing conventional fruits and vegetables and taking the extra care to wash them well before eating or preparing them. "With organic produce, you don't have to wash it as well because it's already pretty clean," Moskovitz said. "With conventional produce, wash it well and pat it dry to get rid of any remaining chemicals." "Grass-fed animal products are higher in monounsatured fats and lower in saturated fats. They're not organic, but typically have more health benefits." While organic food remains in the category of common food myths and misconceptions, experts point out that studies to-date are lacking in proving the nutritional superiority of organic foods. "As a registered dietitian, my main concern at the end of the day is that my clients are eating plenty of fresh fruits and vegetables and getting the nutrients they need," said Moskovitz. "Eating conventional produce is not harmful if you wash it properly. What is harmful is not eating them at all." What caused the obesity crisis in the West? Contrary to popular belief, we as a race have not become greedier or less active in recent years. But one thing that has changed is the food we eat, and, more specifically, the sheer amount of sugar we ingest. "Genetically, human beings haven't changed, but our environment, our access to cheap food has," says Professor Jimmy Bell, obesity specialist at Imperial College, London. "We're being bombarded every day by the food industry to consume more and more food. "It's a war between our bodies and the demands our body makes, and the accessibility that modern society gives us with food. And as a scientist I feel really depressed, because we are losing the war against obesity." One of the biggest changes in our modern diet stems back to the 1970s when US agriculture embarked on the mass-production of corn and of high-fructose corn syrup, commonly used as a sweetener in processed foods. This led to a massive surge in the quantities of cheaper food being supplied to American supermarkets, everything from cheap cereal to cheap biscuits. As a result, burgers got bigger and fries (fried in corn oil) got fattier. According to nutritionist Marion Nestle, this paved the way for obesity. "The number of calories produced in America, and available to American consumers, went from 3,200 in the 1970s and early 80s to 3,900 per person, almost twice as much as anybody needed. And that enormous increase, I think it's the cause of a great deal of difficulty," she says. High Fructose Corn Syrup (HFCS), a highly sweet by-product of waste corn, was also incredibly cheap. It began being used in every conceivable food - pizzas, coleslaw, meat. It provided a "just baked" sheen on bread and cakes. By the mid 1980s, corn syrup had replaced sugar in fizzy soft drinks. The move made financial sense from the soft drink companies' point of view, as corn syrup was a third cheaper than sugar. But it was also sweeter and, argue some scientists, more addictive. In the next two decades, the average American's consumption of fizzy drinks almost doubled - from 350 cans a year to 600. But Susan Neely from the American Beverage Association says the increased consumption of fizzy drinks is not to blame for increased obesity in the West. "The evidence says that obesity is caused when people consume too many calories without the exercise to balance it out," she says. "Certainly our regular soft drinks are a source of calories, so if you're consuming too many calories and watching too much television or not getting enough exercise, you're going to have a problem." Dr Jean-Marc Schwarz from San Francisco General Hospital says it's the sheer amount of fructose being consumed that makes it dangerous. Sucrose is the sugar we know as basic table sugar. It contains both glucose and fructose. Glucose is found in fruits in small amounts. Glucose syrup is made from corn starch. Fructose is the main sugar occurring naturally in all fruits. It also occurs in high-fructose corn syrup. "It doesn't have a toxic effect like lead. It's not comparable to lead or mercury, but it's the quantity that just makes it toxic," he says. Fructose is easily converted to fat in the body, and scientists have found that it also suppresses the action of a vital hormone called leptin. "Leptin goes from your fat cells to your brain and tells your brain you've had enough, you don't need to eat that second piece of cheesecake," says Dr Robert Lustig, an endocrinologist. He says when the liver is overloaded with sugars, leptin simply stops working, and as a result the body doesn't know when it's full. "It makes your brain think you're starving and now what you have is a vicious cycle of consumption, disease and addiction. Which explains what has happened the world over," he says. In the mid-1970s, a fierce debate raged behind the closed doors of academia over heart disease. It boiled down to one simple question: what causes it - sugar or fat? The view that fat was to blame prevailed, and in doing so it created an entirely new genre of food - "low-fat" products. The creation of "low fat" promised an immense business opportunity forged from the potential disaster of heart disease. Overnight, low-fat products arrived on the shelves. Low-fat yoghurts, spreads, desserts and biscuits. All with the fat taken out, and largely replaced with sugar. The public embraced the new products, believing them to be healthier. But the more sugar we ate, the more we wanted. By the time anyone began to ask if it was a good thing to replace fat with sugar, it was too late - but it was a decision with huge implications for the obesity crisis. "If fat's the cause, that's a good thing to do," says Dr Lustig. 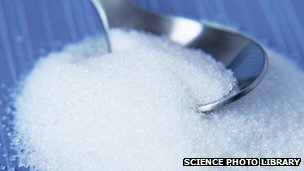 "If sugar's the cause, that's a disastrous thing to do… and I think over the last 30 years we've answered that question." David Kessler, the ex-head of the US government's most powerful food agency, the Food and Drug Administration, believes sugar - together with fat and salt - appeals to our brains in the same way as addictive substances. "It gives you this momentary bliss," Mr Kessler says. "So when you're eating food that is highly hedonic, it sort of takes over your brain." Terry Jones, from the UK's Food and Drink Federation, says: "All the time the science is changing, the thinking around how to tackle the problem is changing. "This is an industry which takes its responsibilities very seriously. It has already done an awful lot and will continue to do so, and we know that there's a real commitment behind us playing our full part in public health." The US Sugar Association are keen to point out that that sugar intake alone "is not linked to any lifestyle disease", but scientists are now beginning to think there is something specific about fructose which accelerates obesity. If a link with obesity is established beyond doubt, we could see the food industry creating a whole new market for low-sugar products, according to former Coca-Cola executive Hank Cardello, who is campaigning to get corporations to tackle obesity. "The silver lining in the challenge of obesity is that even though it's a problem, it creates a galvanising effect. "Companies need to make money, and consumers need to eat food that is convenient and tastes good, and from the public health perspective we need products that are healthier. And all those need to come together." That's what they said about high fructose corn syrup. They said it's healthy because it is made from corns but what they didn't said to us is, it is made from GMO corns. Is China the next Global Economic Leader?